Quaint and Quirky: May Giveaway Day! Today is Sew Mama Sew's Giveaway Day! I am going to do two giveaways today. One is for a handmade tote bag. It's not my usual color palette, but it's a bright and cheerful bag. It is decorated with a plaid flower pin that is totally removable, so you could wear it on a sweater, blouse, or belt. I'll throw in some ribbon from my abundant ribbon collection too! In the comment section, please tell me WHICH giveaway you would like to enter. While you are here, follow my blog! I have lots of giveaways planned for the future, as well as baby projects and maternity projects! We can be friends! What a great giveaway! I want to be in the drawing for both!! Beautiful giveaways! I would love to win either - but my favorite would be the totebag and pin. I would love to win the totebag! You have incredible talent! I would be honored to carry that beautiful bag! Awesome giveaway! I'd love to be in the drawing for either one. Thanks!! I would love both, but I could really use the fabric :) Thanks for the chance. Awesome Stuff. I'll throw my hat in for the tote. I already have fabric up to my eyeballs. i would love to win the fabric! i've been trying to get my hands on some chiffon to make a top with. thanks for the giveaway. i adore your blog! I love the bag but the fabric would be great too. Thanks for a great giveaway! I love the bag! Please add me to the drawing! I would love to win either one! What a great tote! It would be my first choice. Thanks for the great giveaways! Fun Giveaway! I love both! Crazy-cute giveaway! Thank you for putting together this creatively awesome prize! Please enter me for the tote and pin--I'd love to win them! I love the bright totebag and pin! Tote and pin. Love that tote! I would love to win either! There's no way to choose I'd have to enter both! Thanks! What a great giveaway. I love the totebag!What a beautiful bag. Your bag is just darling, and I was touched by the Mom tribute. Well done . . .
Hi there! :) I would love to win either one! I'd love to win the tote bag and pin. I like those bright colors. What a beautiful bag. Would love to win it! Oh wow - that bag is GREAT! I've been meaning to make a great tote bag but the pattern and fabric just sit there, mocking me. Thanks for the chance to win! Fun giveaway- I would love to win the bag-so cute and fun fabric!! I love the totebag. 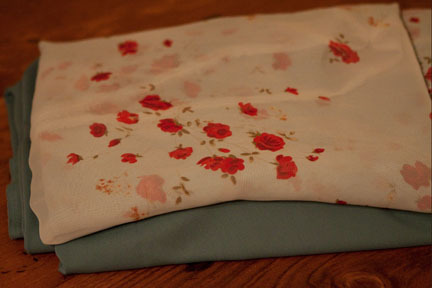 I'm making a skirt out of the same floral fabric. Both, please! The tote is lovely and the chiffon is beautiful! Thanks for the chance. I would love to win the totebag. Both for me! ;o) Thanks, Keri! Miss you! I'd love that bag - it's fabulous! I've gotta go for the supplies, anything 'I' win, is going to my friend Kali who lost her crafting supplies (and most of her house) in the flooding that happened recently in Tennesse! I would love to win the Handbag. It's lovely! I adore the tote bag and pin. Great job! I've started following your blog :) I'd love to be a part of either giveaway! I love them both! The fabric you chose for the bag is so bright, it just pops. I find that I am always in need of another tote! Thanks for the chance to win! I love the tote bag! Thanks for the giveaway! I'd love either one! This is fun! Love the tote and pin-too pretty!! I love the bag and pin....so cute!!! Nice giveawy, I do like both. I'd love to win the fabric and ribbon! This is a great giveaway and I love love the bag. I have to be entered in both though. It's always fun to see what you come up with. What a great bag! I love the colors! THanks for the chance to win. Fun giveaway. I would love to be in both drawings! Thanks for his chance! I love the tote bag and pin! Thank you for this great giveaway! I'd love that bag for a mama's purse (crafty supplies, diaper...). Crossing my fingers! That is a GORGEOUS bag. Keri, I love that bag! I would love to be entered in that giveaway! You are so talented! Please enter me for the totebag and pin! Such lovely creations! I'd love to enter both giveaways - the chiffon fabric is really pretty. I can choose cause they are both soo nice to win! So I would like to win both if possible. That totebag is adorable! Love the big bold print! I would love to win the totebag for my daughter, they are her favorite colors ! I would love to win the totebag and pin! I would love to win the bag and pin. Super cute! I would love to win eiher of these fabulous prizes!!! I want to enter drawing #1!!! I love the totebag and pin! Would love to be friends,come and visit me too. I pick either one of your giveaways they are both awesome. Thanks for sharing. I would love to be in the running for both, but I like the bag and pin best! Lovely tote bag! Thanks for the chance to win it! How about both?! Thank you! great giveaway. I love both. Hi, please enter me for prize #2, thank you so much for the chance to win! I'd like to be in the drawing for both giveaways. Either one would be wonderful! Thanks! I would love the totebag! I like the totebag! Very nice. Thanks for the great giveaway! I definitely want to be in the first giveaway. I have made many bags from that AH print but have given them all away. This one would be for me! the tote is really pretty, i love the fabric contrast, and i also love the fabrics :D thanks for hosting the giveaway! Please enter me for #1. Thanks for a great giveaway. OHHH...I love the tote! It speaks to me! Enter me in both! The tote is cute and the fabric would be put to good use here! Beautiful bag! My favorite is the totebag and pin! Love the bag, great colors! So great! I'd love to be in the drawing for that pretty bag. Enter me for both please! Definately enter me in both giveaways. Awesome pin on that tote!! The bag is adorable! I'd love to have it! Wow, well since there is an option for Both I will go with that. I love the colors of the bag. How could you not be happy carrying around such a fun and chipper bag! Thanks for the chance to win! I love the bag!!! Definately both! But that chiffon fabric is call out to me to make a scarf...and the tote I know my daughter will snag the minute she comes home from college! I LOVE LOVE LOVE the bag and pin. I hope I'm your winner winner chicken dinner! I would love to win the tote! Love the colours. Thanks for the chance. I love the totebag and the pin! Please put me in for #1. Thanks so much! great giveaway, id love the tote bag! Love the tote and pin! Please enter me for giveaway #1. So generous of you! Thanks! I would love to win both, but my fave is the fabric!! Both are really awesome giveaways!! Tote is my #1 choice, but I love them both! Fabric and ribbon. Thanks for the great giveaway. I would love to win the tote bag and pin. Love the bag! What perfect summer colors! I love the bag and the pin! They are gorgeous! Thanks! #1 - Totebag and pin! What a lovely giveaway you are offering. I'd love to be in the drawing for either option. That tote you made out of some of my favorite fabric. :) Thank you for the giveaway! Love the totebag - pretty colors. What a great giveaway! I would be happy to win either one but if I have to choose I would probably have to go with the fabric. Please enter me in both!! I would love either... but if I had to choose it would be the adorable tote! I would love to win that super cute bag! Thanks for the chance to win! Just found your adorable blog. I would love to be entered for both. and I am definitely becoming a follower!! Both. I love the chiffon, and I love the pin. The tote is pretty nice, too. Thanks a bunch. What a fun giveaway! Either is great - but I love the tote! oh! #1 is awesome :) thanks for the chance to win! IT's TOTE love her in Virginia!!!! I'd love to win both LOL :) But I can share! I'd pick the fabric. Thank you so much for the chance to win. Both are great giveaways, so I think I'd like to be entered in both! Thanks for the chance. What great giveaways! I love the tote - so bright and cheery! I love the fabric and would love to win, Keri! I am in love with your bag! 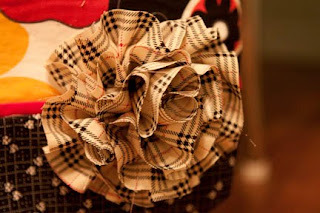 THe plaid pin would definately have to stay if it lived at my house! Thank you! Oh, I love that bag & pin! I LOVE the bag! Thanks for the chance to win something beautiful! I love the colors in the bag. Tote bag and pin please! Thank you for great giveaway goodies. thanks for the giveaway. i would love to win the fabric! Fabulous giveaways! I really love the tote bag and pin! I can't choose!!!! Please put me in for both...thank you! I'd love to enter the giveaway for the bag and pin! I love that tote bag. cute fabric. I like totebag and pin. I think you have created a wonderful giveaway and your winners will be both lucky and very happy. I love your beautiful tote bag- the colors are so rich looking and I love wearing pins. I would like to enter the tote bag giveaway. That would be my firt choice. Count me in!! Great give away! I LOVE THE BAG- IT IS SO ME!!! The totebag is awesome. Thanks for entering me in your sweet giveaway! I love the tote! it is my color. I want to be in both drawings. thanks for the chance. I would like to be in both! I love the totebag, and I love the chiffon fabric! Love both but would choose the totebag and pin. Thanks. I do like both but, I'm really digging #1.Thanks! oooo! it's so hard to choose which one! i love them both equally! Love the cheery colors of the totebag! i would love to win the fabric and ribbon! I feel greedy saying BOTH! I like that this giveaway fabric is for more than fat quarters or 1 yard -- more yardage gives more options! what a lovely totebag! and the pin!!!! just beautiful, as always. Thanks! I would love the totebag and pin! Thanks for this great giveaway! Precious! Totebag and pin are just great! I would like to be in the fabric and ribbon drawing. Thanks for the giveaway. I love the purse. And that flower is too cute, I can already see many cute things that it would embellish! But I guess I can enter both too :) And I am already a follower. Thanks girl! Of course I'll say BOTH! 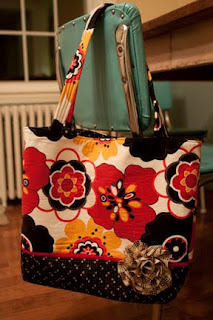 The fabric is fun and whimsical and the bag is so bold an beautiful..the best of both worlds! OOOOh, I'd love to win both. Either one would send me over the moon--what a great giveaway. I'm so glad I don't have to pick because they both look great! I love both the prizes! I would be happy with either one. Both are great! Thanks for the giveaway! Ooh that tote is gorgeous. I would love to win both but if you choose to draw two winners, I'd love the tote. Thank you for the giveaway. I'd love the bag!!! great fabric! ummm... this is a no-brainer--both giveaways please!!! I would like the tote bag. I think my daughter would like to use it as a book bag. Thanks for the chance to win. I would like to enter both! I would love to have either/both.